We would like to thank Gate Keeper Games for the preview copy of A.D.A.P.T used for this preview. Other than receiving the preview copy we at Geeky Hobbies received no other compensation. Receiving the preview copy had no impact on the content of this preview. The Kickstarter for A.D.A.P.T. is launching on January 19th, 2016. Due to the game being a Kickstarter game, the preview copy of A.D.A.P.T. I received from Gate Keeper Games is a prototype copy of the game. The card artwork and/or design may change for the final version of the game so the final components may look different than the pictures shown in this preview. The rules presented below may also be tweaked or changed for the final version of the game. Create the most powerful fish in the sea and destroy the other fish. Each player takes a player mat, a guppy card, and an experience die (d20). Each player places the guppy card in the center spot of their game board. The rest of the cards are shuffled to form the draw deck. Cards from the draw deck are flipped over to create the Gene Stream based on how many players there are in the game (number of players+1). Here is an example of the game being set up for two players. 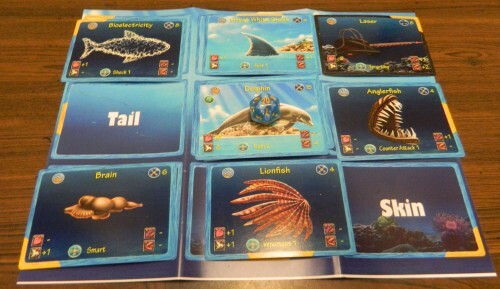 Each player has their own playing board with their guppy card placed in the center of the game board. In the center is the draw pile. There are then three cards for the gene stream, and at the bottom is the discard pile. To begin the game each player will adapt by random selection by rolling two d10s which are combined together to form a number from 1-100. This number is used to randomly give each player a card to start the game or some additional experience. Whoever rolled the highest number gets to start the game. 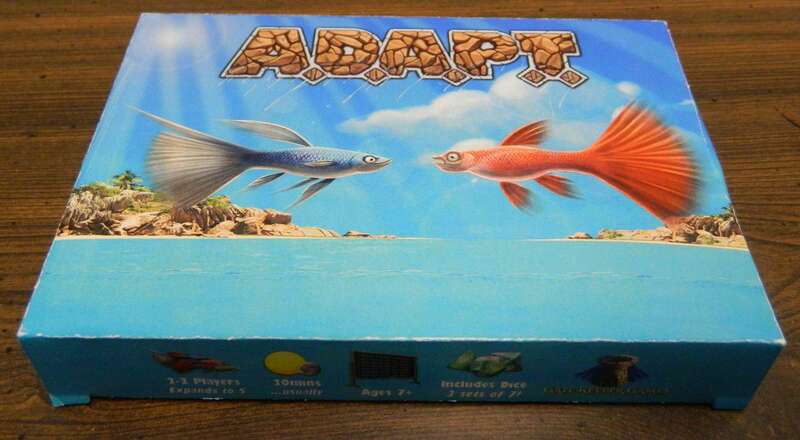 Adapt: Adapt a body or part from your personal gene pool to your fish. Buy: Buy a new part from the Gene Stream by paying the experience cost and adapting it if possible. If you can’t currently adapt the part you place it in your personal gene pool to adapt in a future turn. Attack: Attack one of the other fish. Special Action: Use one of the special actions from one of your adapted cards. Wipe the Gene Stream: Discard all of the cards from the gene stream and gain +3 experience. This action cannot be performed if there is a body in the gene stream that is one level higher than the body of one of the player’s fish. If you are unable to perform any of the above actions you will adapt by random selection as explained in the setup section. Here is a picture of a card from A.D.A.P.T. In the top left corner is the card’s level indicated by how many waves are colored in and the dice that the fish will use in combat. In the top right is the amount of experience required to purchase the card from the gene stream. In the bottom left is the amount of heath that the card adds (heart symbol) and the card’s survival skill (tail symbol). In the bottom right of the card is the card’s lethality (pink symbol) and the card’s ferocity (teeth symbol). Finally along the bottom of the card is the special ability that the card has. 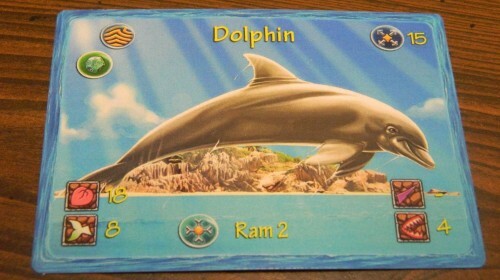 The key to adapting your fish is your fish’s body card (the card in the center of your play mat). When adapting your fish’s body, the level of fish’s body can only go up one level at a time. For example if your body is currently level one you can only adapt a level two body. The one exception to this rule is if you are a guppy (level 0) you can upgrade to a level one or two body. If you purchase a body that is more than one level higher than your current body you must place it in your personal gene pool where you can add it on a future turn. Here is an example of the path that your fish’s body can take (from left to right along the top and then the bottom two cards). All fish start as a level 0 guppy. The guppy can then be upgraded to a level one or two body. After that initial upgrade all future upgrades can only be one level higher than the previous upgrade. To adapt any parts other than the body, the body part must be within two levels of your fish’s body. If you body is a level one you can only adapt level one, level two or level three body parts. Any body parts that can’t be adapted are put in a player’s personal gene pool. In the center of the picture is a level one body card. If this was your current body you could equip the two cards on the left because they are both level two cards. You could not equip the two cards on the right though since they are both level four cards. When you adapt a body or body part card you place it onto the corresponding spot on your player mat. If there is a card already on that spot, the new card is placed on top of the old card. The new card’s abilities go into affect immediately but you lose any abilities from the card that was replaced. Here is a picture of a player’s board after some turns have passed. The player has added body parts to all of the places on the board other than the tail and skin section. Based on the cards equipped the player has nine health, nine survival, three lethality, and three ferocity. The fish also has shock, fear, targeting, counter attack, smart and venomous special abilities. One time during the game your fish may have to auto adapt. This is not optional but it does not use up your action for the current turn. This occurs the first time your amount of experience reaches 20. If your fish’s body is already level five, your fish does not auto adapt. Starting with your personal gene pool, then moving to the gene stream (starting at the bottom), and finally moving to the draw deck; you look for the first body card that is one level higher than your current body. This card is adapted immediately. If the card was in your personal gene stream you pay no experience to adapt the card but if you got it from the gene stream or the draw deck you have to pay an experience cost to adapt the card. If after adopting a body or body part card your fish has less health than damage taken, your fish is not killed but you do not remove any damage from your fish. Your fish is treated as if it has one health remaining until you add body parts that increase your health or you heal. When a player chooses to attack they use the attack die indicated on the fish’s body card. Before rolling the die the player has to choose their target. Guppies can’t attack unless they have added body parts that have added at least +2 ferocity. 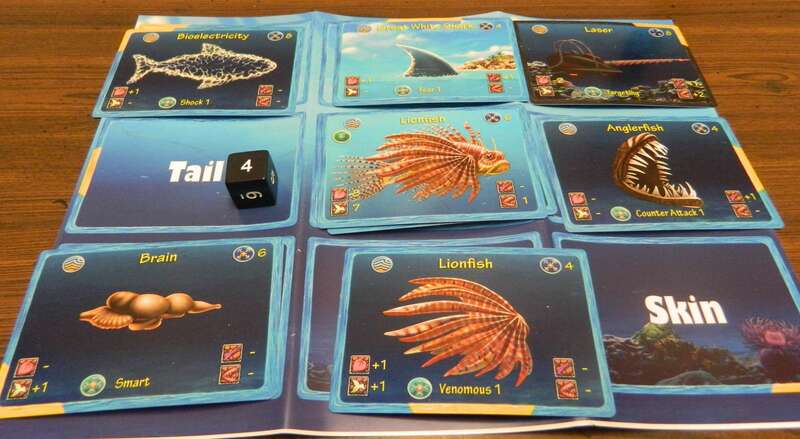 Players calculate their attack strength by combining their ferocity score from their body card and all of their body parts with the number they rolled on their fish’s attack die. This attack strength is compared to the total survival score (comes from body and body part cards) of the target fish. The current player rolled a four on their attack die. The fish has a ferocity of three so the fish’s total attack is seven. If the attack total is less than the survival score, the fish does no damage but gains experience equal to the difference between the two numbers. For example if the attacking fish’s attack score was five and the survival score was seven the attacking fish would gain two experience but cause no damage to the other fish. If the attack total is higher than the survival score, the attacking fish will do damage to the fish they were attacking. They deal damage equal to the difference between the attack total and survival score plus additional damage equal to the attacking fish’s lethality (up to a max of +4). The attacked fish keeps track of damage using a die to indicate the total amount of damage they have taken. If the attack total and survival score are equal, the attacking fish does one damage plus lethality. The attacking fish also gains two experience. If the fish that was attacked now has more damage taken than total health, the fish is killed and they are eliminated from the game. This fish currently has nineteen health. Twenty damage has been dealt to the fish so the fish is killed and the player is eliminated from the game. Remove any cards that are meant to be removed due to being bought, randomly selected, wiped or expired). Slide all remaining cards down a slot in the gene stream. If the draw pile is exhausted, shuffle the discard pile. Deal out new cards to fill up all of the empty slots in the gene stream starting from the bottom and moving up. If during a player’s turn no cards are removed from the gene stream the card on the bottom is discarded and a new card is placed at the top of the gene stream. Players place cards that they currently can’t adapt into their personal gene pool. Players can only have three cards in the personal gene pool at one time. You are unable to buy a body that is equal to or lower than the level of your current body or any body you already have in your personal gene pool. You can purchase body parts of any level though. If you get a body part that you can’t adapt by random selection and you already have three cards in your personal gene pool, you discard the new card and don’t get a new card. 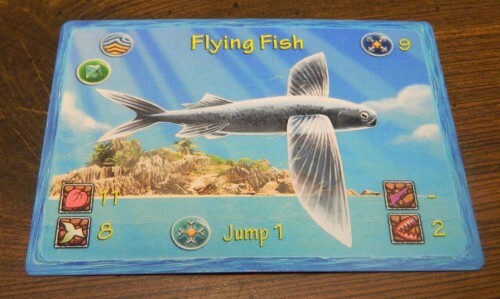 This flying fish card gives the player that uses the card the “jump” ability. Some of the cards in A.D.A.P.T. give players special abilities that they can use throughout the game. Some of these abilities are passive while others require a cooldown after they are used. While I am not going to go into detail of what each special ability does, here are a list of the special abilities included in the game. Recently Geeky Hobbies received a preview copy of the Kickstarter game A.D.A.P.T. whose Kickstarter campaign launches on January 19th, 2016. While we don’t get a lot of Kickstarter games here on Geeky Hobbies I like to try out Kickstarter games since I like to support smaller designers/publishers and Kickstarter games generally have interesting ideas that usually wouldn’t be made by larger publishers. When Gate Keeper Games asked us if we wanted to preview A.D.A.P.T. I was interested in trying out the game since it looked like an interesting card/dice game. After playing a couple games of A.D.A.P.T I would say that the game has quite a bit of potential. The game is an interesting combination of a dice and a card game even though I would say that it is more of a card game than a dice game. Most of the game is spent acquiring cards that make your fish more powerful. The dice are mostly used for attacking and rolling for success or failure for certain special abilities. The main mechanic in the game is creating your fish. This is the game’s strength in my opinion. While the amount of rules and mechanics are a little overwhelming at first (mostly due to so many different special abilities), when you get a hang of the game it becomes pretty accessible. It took me about a game to fully understand how to play it. Once you get a hang of playing the game though you can play the game quite quickly without having to reference the rules outside of looking up what some of the special abilities do. While you will eventually learn what each special ability does I kind of wish the cards would have some symbols printed on them which could give you a quick reminder of what each special ability does so you don’t have to go back and reference the rules. While you might not fully understand the game right away you can adapt to it pretty quickly. Once you know what you are doing the game starts to pick up. The building of a “masterfish” is a fun mechanic. While luck comes into play deciding which cards you can add to your fish, there is some strategy to how you build your fish. No matter what cards you add to your fish it will have it’s own strengths and weaknesses. You can build a powerful fish with a lot of damage potential but it could either not have a lot of health or it could have poor defense which makes it easier for other fish to attack. Fish can also have special abilities that either give them abilities to counter attack other fish or even find ways to prevent other fish from attacking them. While it is not a game that I would play all of the time, I had fun with A.D.A.P.T. I see it as a game that I would play every so often. I played the game as a two player game even though the game supports up to three players with the base set or up to six with some of the expansion sets. As a two player game I think the game works well. Since the game plays like a fight it is not that surprising that the game works well with two players since both players just have to focus on trying to kill their opponent’s fish. As far as a three to six player game I can’t really comment on how well it plays. Lengthwise I think the game would work perfectly fine with more players since once you know how to play you can usually finish a turn in a couple minutes at most. While it will obviously take more time with more players, I don’t think a game with six players will take so long that you will feel like the game overstayed its’ welcome. My only concern with having more than two players is the chance that players could easily decide to gang up on one of the other players to eliminate them from the game. The biggest complaint I have with the game is that at times it kind of relies too much on luck. The cards available for a player to purchase are key to your success in the game. If one player gets lucky and gets better cards to purchase they are likely going to win the game. This problem is persistent in every card game though since the luck of the draw is always present. At least in the games I played though there were too many situations when the gene stream would be filled with cards that would be pointless for the players either because they were too high or too low of level. This meant that one player would eventually have to clear the gene stream which would waste their turn and give the other player(s) the first chance at the new cards that are put out. This happened multiple times to me in one of the games that I played and it should come as no surprise that I was destroyed in the game. I wish there were either more cards in the gene stream or players would be able to clear it and still have the first opportunity to take one of the new cards that are put out. The biggest area where luck comes into play is with who is able to get body cards the fastest in the game. Based on the games I played your fish’s body is crucial to winning the game. If your fish’s level falls behind the other player(s) you will lose the game as I experienced in two games that I played. In one game I was stuck with a level two body since bodies were rarely ever added to the gene stream. The other player got up to a level four or five body and the game was over as I was utterly destroyed. In another game pretty much the same thing happened but I almost ended up winning since the other player had terrible luck rolling their attack die. The body cards are critical for your success in the game. They are generally responsible for most of your statistics in the game so if you fall behind you will be substantially outmatched. You will also be hindered with what body parts you can equip. I really wish the game had another way to upgrade your body other than relying on a body card coming up. I actually wish the game had a mechanic similar to the auto adaptation rule that players could use at any time. The game should allow players to pay a higher cost to be able to upgrade their body at any time. By having to pay more for the body card the player is still hurt but the player can still stand a chance in the game since they won’t fall behind so quickly. Update: After hearing back from the designer I have learned that there are a couple planned rule additions/house rules that will be included with the game that will deal with making it easier to upgrade your body. There is going to be a variant for the 3+ player version of the game where players will be able to upgrade their bodies two levels at a time at any time. For example a player can upgrade from a level one to level three body instead of having to wait for a level two body. This should help since I encountered situations in the game where using this rule could really help. This rule could also be used if players want a shorter game since the faster you upgrade your body the faster the game plays. Another additional rule that the designer is thinking about adding to the game is a rule that involves letting players use the auto adapt rules as many times as they want in the game with a penalty for each time a player uses it. The first auto adapt would still be mandatory but every additional auto adapt would be optional. The cost of using the additional auto adapts would be to lower the amount of experience you would receive at the beginning of your turn each time you used the option. For example the second time you use the auto adapt you would only get two experience at the beginning of your turn. While I have yet to try this rule I think it would be a good addition to the game. It helps players who fall behind preventing runaway wins but also assesses a penalty to the player. This allows players to catch up but doesn’t feel like a way to just let people back into the game if they have fallen behind. The game’s pacing has its’ ups and downs. It was probably due to bad luck with how the cards were shuffled but the game seems to start a little slow. In the games I played too many high level cards made their way into the gene stream early in the game which meant that neither player was able to do much to start the game other than continuing to recycle the gene stream. Eventually this picked up and probably won’t be an issue most of the time since I just think we got unlucky that so many high level cards were some of the first cards put out. Once players are able to start putting parts on their fish though the pace starts to pick up quite a bit. The game does have a runaway leader problem at times where one player will just dominate the other player due to good luck or a poor decision by the other player. In one of the games that I played I had no chance of winning the game after a couple rounds. I just had to wait for the other player to finish me off. Update: With the added rules helping players upgrade their bodies easier, the runaway winner issue should be reduced significantly. It will probably still be present in the occasional game but with the additional rules there are more ways for a player to catch up which is a good thing for the game in my opinion. If neither player gets out to a big lead though the game is generally really tight throughout. As a matter of fact in one game we actually ended up both dying on the last turn. The other player attacked my fish killing it by a large margin but due to a counter attack I was able to kill his fish as well. Due to the difference in how much the two fish were killed by we determined that I still lost the game. Overall the cards included in the prototype seem to be pretty balanced. Most of the bodies seem to be pretty balanced with some offering more attack, health, defense and some even offering special abilities. While I haven’t played the game enough to truly judge whether some cards are better than others, I like that all of the cards have their own strengths and weaknesses. Some of the special abilities seem a little unbalanced though. Some seem a little too powerful while others are a little weak. I would add a mechanic similar to the auto adaptation that players could use at any time to acquire the next body level with some form of punishment for using the ability. This would prevent a player from falling behind too quickly. Update: After hearing back from the designer there are some planned additions to the game and some house rules that are going to be included that will address some of these issues by making it easier to upgrade your body. I wish there was an easier way to heal your fish. Outside of getting a body part that has regeneration there is no way to heal your fish. There aren’t a lot of cards that have regeneration so it is really hard to heal your fish. I wish there was an option that you could use your turn to heal some health points. The rule where you gain experience for failing to successfully attack another fish has some flaws. Basically when I fell behind in the game I purposely attacked fish I knew I had no chance of successfully attacking just to gain a bunch of experience that I could use in a future turn. I think a failed attack should have some sort of punishment which might include either letting the attacked fish automatically attack you or taking a couple points of damage. Being a prototype copy, the game rules could use a little polish. As far as the component quality is concerned for being a prototype copy of the game I have to say that the quality is quite good. All of the cards included don’t yet have the final artwork but based on the cards that do have artwork I have to say that the artwork is quite good. The artwork is not a reason to specifically buy the game but you shouldn’t be disappointed with it. The cards in general are well designed since it is really easy to find the information that you need on every card. I especially liked the yellow border on every body part card that indicates the spot on your board where you are supposed to place the body part. The cardstock for the prototype is also quite good so I would assume the final copy would be quite good in this regard. The dice sample that was included with the game also looks quite nice. I only have a couple slight complaints with the prototype copy of the game. The levels are kind of hard to distinguish on some of the cards. I like that the game used a more artistic way of displaying a card’s level but it might be a easier if the cards would just show some sort of number to indicate the level so you don’t have to worry about counting the lines to determine a card’s level. 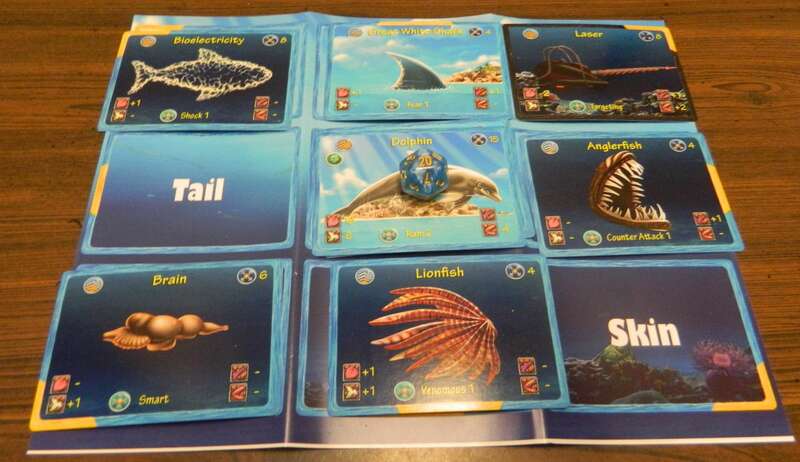 On some of the cards it was kind of hard to see what dice each fish was supposed to use for its attack dice. The final version of the game may have the die indicator color coded in order to distinguish which dice each fish uses. Otherwise I am guessing the final graphics will be easier to distinguish between the different dice. Update: After hearing back from the designer I can confirm that these issues are due to the cards being prototypes. These issues will be addressed for the final version of the game making the levels and dice easier to distinguish. After playing a couple of games of A.D.A.P.T. I thought it was a solid game that has potential to be a good/great card battling game with some slight tweaks to the rules. My only real complaint with the game was that at times luck is too prevalent which allows some players to win in a blowout while the other player(s) have no chance of winning the game. Otherwise the game is easy to play after a game of adjusting to the rules. The mechanic of building your own fish is fun and interesting since you can tweak your fish in order to build a fish that fits the type of strategy that you want to implement. Update: With some of the additional rules that are being planned to be added to the game I think the reliance on luck will be reduced which is a good thing for the game. If the theme or the game’s concept doesn’t really interest you I don’t think A.D.A.P.T. will change your mind. If the game looks interesting to you though I think you will enjoy A.D.A.P.T. The A.D.A.P.T. Kickstarter campaign starts on January 19th, 2016. Additional details along with a link to the campaign page will be added to this preview after the campaign kicks off. Update: The Kickstarter campaign for A.D.A.P.T. launched today. If you are interested in checking out the campaign you can find it’s Kickstarter page here. To receive a copy of the game you need to pledge at least $29. If you pledge more that $49 you will receive the base game and five bonus card packs. The Kickstarter campaign runs until February 19th, 2016 and if successful the game is expected to ship out in the middle of 2016. The game offers some interesting decisions as you upgrade your fish. The game's artwork is quite nice. The game is quick to play once you get a hang of the rules. Players can fall behind quickly if they aren't able to upgrade their body card. The rules take a while to adjust to. In some places the rules could use a little tweaking.